It's 1602... Merchants from the rich provinces of Holland and neighbouring Zealand gather in stately rooms to discuss the foundation of a mighty consortium: a company that will hold the monopoly of the very profitable East Indies trade. One question occupies their minds more than anything: who will control the new company? Each player takes the role of a merchant living at the end of the sixteenth century. These merchants sent out ships to explore and expand the profitable trade in the east, where they traded cloves, nutmeg, silk and tea in such remote areas as India, Indonesia, China and Japan. These goods were then sold at great profit in the West. The journey, however, was a dangerous one and fitting out a ship was prohibitively expensive. Merchants therefore cooperated in small groups, called 'compagnie' in Dutch, to fit out ships together. At the same time, competition was cut-throat, not only at home, where Amsterdam was the most fearsome rival, but also abroad. Your task in this game is be to make as large a profit as you can - but at the same time uphold the honor of your home town against the mighty merchants from Amsterdam. This box contains two game versions: the basic game, which can be played by 4 or 5 players, and the advanced game, for 3 to 5 players. The basic game is suited for people aged 10 onwards and takes about an hour. The advanced game is intended for people aged 14 and older, and takes between 90-120 minutes, depending on how long you spend negotiating. 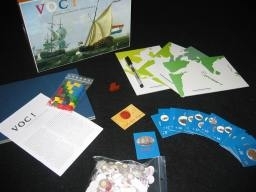 The game contains wooden cubes, representing seemen and merchants; a board; four erasable maps of the far East, on which the players can draw their course; cardboard counters for the various types of goods; contract cards which indicate the value and the demand for the various types of goods; game rules in English and German; and several other parts. VOC! was published by us in 2002 as a joint project with the city of Middelburg. It had a very large print run, of which about 50% was in Dutch with the title " Naar de Oost!". These were sold by museums and bookshops in the Netherlands. The international version, " VOC!" was made for the gaming public. The game combines heavy trading and negotiating with a strange trick: drawing on screens with your eyes closed. To appreciate the game, you therefore need a strange mixture of playing styles. The game uses a lot of original period artwork such as the front cover and the maps. If you can no longer find a cheap copy at a retailer near you, you can buy one of our last copies at collector's prices. Question: What is the meaning of the numbers above the goods on the contract cards? Answer: These indicate how many goods are needed to fulfill the contract. Question: There is a contract with on one side two cinnamon, two nutmeg and two cloves, and on the other side just one pepper. Is this card correct? Answer: Yes and no. The game can be played with this card as it is, but the task on the left side of the card will be much to difficult then, so that one will always do the right side. It is, in fact, a printing error. We intended this card to be for one cinnamon, one nutmeg and one clove, or two pepper. There is an error in the printed rules: of course, the game does not start in 1590, but in 1585; to be precise, the game starts in the third phase (investments) of 1585. Phase 1 (new orders) is not played in the first year. Thus, when the first investment phase starts, three contracts are available. There is an error in the printed rules: the oldest card is given to Amsterdam when there are six cards present (not five). Above that, no card will be taken from the pile in the first year (1585). 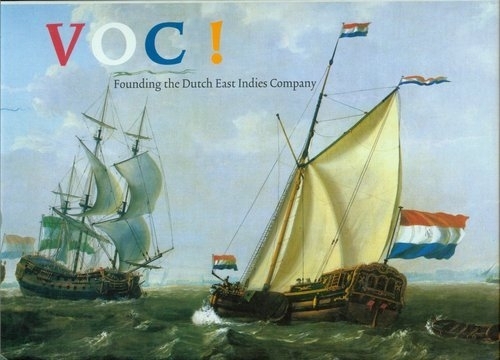 Question: When the VOC card is turned open, does the game end immediately, or only after the current year has ended? Answer: The game ends immediately. No contract is given to Amsterdam. Question: What happens if you run aground after reaching a harbour? Answer: The harbors themselves (the encircled areas on the navigation sheets) are safe: as long as you stay inside the circle, you do not run aground, not even if you draw across the coast line (this is not explained in the printed rules). The other players may not say "Land Ho!" yet. Only if you draw on the land outside the circle, you run aground. In that case, the merchants can take in goods first; after that, a sailor falls overboard. Question: Do you need to stop drawing exactly on the blue line, in order to sail home? Answer: No. The printed rules are not correct. As soon as the skipper hits the blue line, the ships sails home automatically, whether he wants it or not. The other players are allowed to tell him. Any drawing after hitting the blue line is ignored. It is convenient to put the year markers in a row on top of the board. Answer: The game ends immediately. Note that Amsterdam does get the contracts which did not have a cube on them at the beginning of the phase, but not the contracts which were just turned open this year. Question: Is there an investment round in every year, or only in the years with a ships' convoy? Answer: Every year. Some people got this explained wrong at the fair in Essen. Question: Is it possible to invest in ships already in the East? Question: Is it allowed to place less than four men? Answer: This is allowed only if you have not got four dice left anymore, or if the ship on which you want to place them does not have enough free slots. In these cases, you have to place as many dice as possible. Note that you are never allowed to place more sailors than merchants (this rule is missing in the printed edition). Question: Can one choose freely how to place the dice, as long as it is consistent with the numbers of the slots? Question: When a player removes his men from a ship, what happens to the other players' men? Answer: The other players' dice shift right, so that the placement of the dice corresponds to the numbers of the slots again. Dice in the left half of the ship are moved towards the middle of the ship as far as possible; dice in the right half of the ship are moved right as far as possible (this rule is missing in the printed edition). Question: What happens to the year marker on a contract, if the contract is taken over or secured with an earlier year marker? Answer: The year marker which was on the contract before, is placed back on top of the board, so that it can be reused later for other contracts. Question: Can contracts be fulfilled only in the exact year for which they were taken, or can they be fulfilled earlier? Answer: It is allowed to fulfill them earlier.